87% of people don’t understand this rapidly growing market. Do you? According to Accenture, around 87% of mainstream consumers still don’t understand what the IoT market is. Therefore, let’s take a moment and review these 11 key statistics that everyone should know about the Internet of Things. 1. 50 to 200 billion connected devices by 2020: Networking giant Cisco estimates that the number of connected devices worldwide will rise from 15 billion today to 50 billion by 2020. Intel is even more bullish, claiming that over 200 billion devices will be connected by then. 2. The $79 billion smart-home industry: The smart-home industry, which consists of smart appliances and switches tethered to the cloud and mobile apps, might seem like a niche market for technophiles. But according to Harbor Research and Postscapes, the smart-home industry generated $79.4 billion in revenue in 2014. 3. 173.4 million wearable devices by 2019: Smart-watches and fitness trackers were once considered niche devices, but the Apple Watch, Android Wear devices, and Fitbit’s trackers all piqued public interest in wearable devices. As a result, IDC expects global wearable device shipments to surge from 76.1 million in 2015 to 173.4 million units by 2019. 4. 90% of cars will be connected by 2020: By 2020, 90% of cars will be online, compared with just 2% in 2012, according to Spanish telecom provider Telefonica. That growth will support the in-car infotainment, autonomous-driving, and embedded OS markets. 5. $1.7 trillion in spending by 2020: Global spending on IoT devices and services will rise from $656 billion in 2014 and $698.6 billion to $1.7 trillion in 2020. That growth is expected to be fueled by growth in devices, connectivity solutions, and IT services. 6. 228 million wearables by 2020: Number of connected wearables devices shipped in 2015 worldwide has grown to 72.5 million. 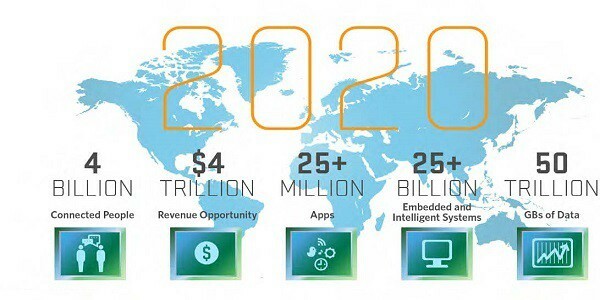 Number of connected wearables to be shipped till 2020 is predicted to be 228.3 million. By 2020 we will have a staggering 6.1 billion smartphone users. 7. Home company SmartThings for $200 million: The IoT will connect many of the devices we have in our homes, from smart thermostats to smart fridges. Companies like Google and Samsung understand this. Google bought smart thermostat maker, Nest Labs, for $3.2 billion, and Samsung purchased connected home company SmartThings for $200 million. 8. Market for wearable devices has grown 223% in 2015: The global market for wearable devices has grown 223% in 2015, with Fitbit shipping 4.4 million devices and Apple selling 3.6 million Apple Watches. 9. Internet-connected clothing: And yes, Internet-connected clothing is coming. Estimates predict that 10.2 million units of smart clothing will ship by 2020, compared to mere 140K units in 2013. 10. Having a connected kitchen could save the food and beverage industry as much as 15% annually. 11. CISCO believes the IoT could generate $4.6 trillion over the next ten years for the public sector, and $14.4 trillion for the private sector. [su_box title=”More From DSIM” box_color=”#c7c7c7″ title_color=”#000000″ radius=”5″]1) CASE STUDY: How Airbnb used Referral Program to increase its booking by 25%?